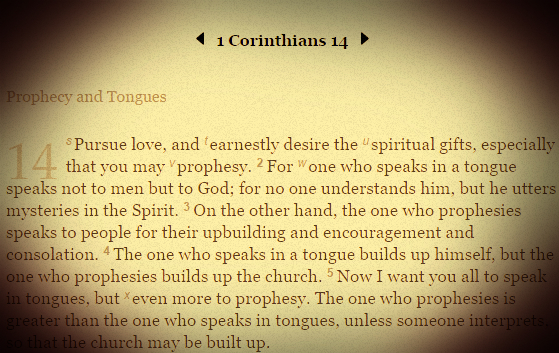 1 Corinthians 14 is the subject of much misunderstanding within the Church. Most of which comes from our lack of Greek knowledge and historical understanding. To start with, this chapter addresses prophesying — but it’s important to note that the Greek word for “prophesy” has two primary meanings: most commonly in the Old Testament, it means to “foretell” (i.e., reveal something about the future, usually pointing to Christ). But in the New Testament, it often means to “forthtell” (i.e., to speak forth the truth and counsel of God — in the modern sense, this includes teaching what He has already revealed to us in Scripture). Needless to say, the latter definition is applicable here. Next, there’s the mention of tongues. People have a tendency to take verse 2 (“For one who speaks in a tongue speaks not to men but to God; for no one understands him, but he utters mysteries in the Spirit”) and separate it from the rest of the passage, while also ignoring the entire historical context. When we read the passage in context, taking into consideration the time period in which it was written, we gather that Paul is very clearly discussing people who spoke in foreign languages (languages other than their native language). He instructed the Church that this gift did have a use, but that use was only applicable in the context of speaking directly to foreigners, who could not understand the language of those native to the land — during that time, God enabled certain people to speak in the languages of other nations to share the Gospel with them. 1 Corinthians 14:2, when read in the context of the letter, simply means something along the lines of this: “When you’re in an English-speaking church, if you try to teach in French, you’d might as well just be speaking to God, because He’s the only one there who understands you.” That’s an extremely modernized paraphrase, but it’s the best way to explain it without getting too deep into history and the Greek language. The rest of the passage sheds more light on this understanding, but people tend to ignore it or pretend it has nothing to do with the first verses.